When Berks Catholic hosted Conrad Weiser in boys hoops on Tuesday night, the Saints were looking to once again finish undefeated in Berks II play. In fact, since the school opened its doors in the fall of 2011, the Saints had not dropped a single Berks II contest, posting a 30-0 mark during their remarkable run. Conrad Weiser, with a win, could earn a share of the Berks II title, though they would still enter the county playoffs as a lower seed due to District 3 power ratings. After celebrating senior night during the pregame, the Saints, led by seniors Nana Foulland and Cooper Kutz, took the the court. The Saints doubled up the Scouts at 12-6 about 5 minutes into the first quarter. When the quarter came to a close, the Saints held a 14-8 lead. Both Nana Foulland and Cooper Kutz had 6 points in the first quarter to lead the Saints, while Cartier Talford led the Scouts with 4. After allowing the Scouts to climb within five at 15-10, the Saints exploded for a 9-0 run before allowing Dexter Jordan to convert from beyond the arc. 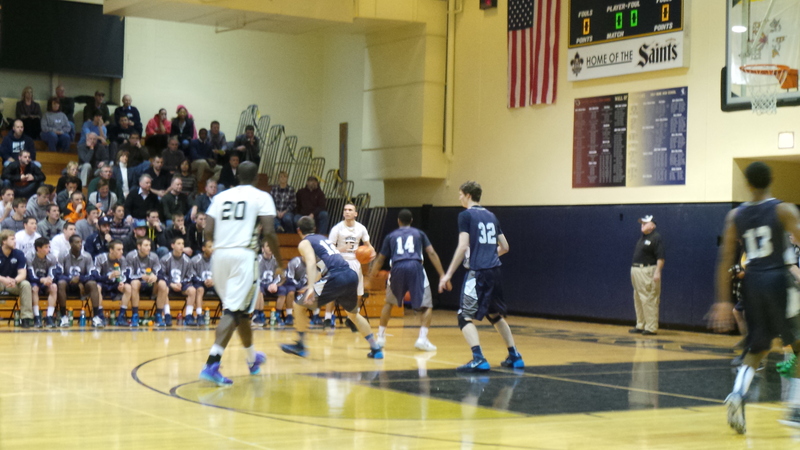 As the buzzer sounded to end the first half, the Saints laid claim to a 29-16 lead. The Scouts saw their big man Andy Orr get into foul trouble early in the second half, which would normally signal doom for Weiser. However, Dexter Jordan took over and controlled the tempo for the Scouts offense, who cut the lead down to 10 after three quarters, despite trailing by as many as 16. As the fourth quarter began, the Saints turned the ball over on their two of their first three possessions, allowing the visitors to climb all the way back to within 6 for the first time since the first quarter. The Saints, who had led 38-22 with 2:29 left in the third quarter, led 40-34 with just 3:20 left to play. Pop Lacey and the Saints would convert on the majority of their 1-and-1 opportunities late in the game, helping push them to a 48-37 lead heading into the final minute of play. When the final horn sounded, the Saints had held on to claim a 49-39 victory. The Saints, who were led by Nana Foulland’s 22 points and 11 rebounds, improved to 18-3 overall, as well as a perfect 10-0 in Berks II. 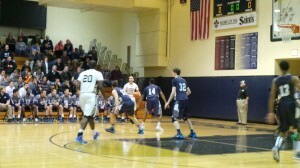 In addition to winning their 31st consecutive Berks II game, the Saints extended their overall win streak to 13 games. The Saints stand at 13-0 since the calendar turned to 2014. Dexter Jordan scored a career-best 21 for the Scouts, who claimed second place in Berks II, as well as a berth in the BCIAA playoffs. The Scouts fell to 14-6 overall and 8-2 in Berks II. Both teams will host make-up games on Thursday evening. The Saints will host Berks III champion Wyomissing, while the Scouts welcome Cocalico.